A cover tree is a tree data structure used for the partitiong of metric spaces to speed up operations like nearest neighbor, -nearest neighbor, or range searches. In this blog post, I introduce cover trees, their uses, their properties, and I measure the effect of the dimension of the metric space on the run-time in an experiment with synthetic data. In the all nearest-neighbors problem, we are given sets and and the goal is to determine the nearest neighbor for each point . If , then we have a monochromatic all nearest-neighbors problem, otherwise the problem is called bichromatic. Finally, there is also the range problem where we are given scalars and where we seek the points -body simulations, and they are elementary operations in machine learning (nearest centroid classification, -means clustering, kernel density estimation, ...) as well as spatial databases. Obviously, computing the nearest neighbor using a sequential search requires linear time. Hence, many space-partitioning data structures were devised that were able to reduce the average complexity though the worst-case bound is often , e.g., for k-d trees or octrees. Cover trees are fast in practice and have great theoretical significance because nearest-neighbor queries have guaranteed logarithmic complexity and they allow the solution of the monochromatic all-nearest-neighbors problem in linear time instead of (see the paper Linear-time Algorithms for Pairwise Statistical Problems). Furthermore, cover trees require only a metric for proper operation and they are oblivious to the representation of the points. This allows one, e.g., to freely mix cartesian and polar coordinates, or to use implicitly defined points. at level the tree has a single root node . What is more, given a prescribed parent node , notice that the separation condition implies that child nodes must inserted in the lowest possible level for otherwise we violate the separation inequality . The definition of the cover trees uses the basis 2 for the definition of the cover radius and the minimum separation but this number can be chosen arbitrarily. In fact, the implementation by Beygelzimer/Kakade/Langford uses the basis 1.3 and MLPACK defaults to 2 but allows user-provided values chosen at run-time. In this blog post and in my implementation I use the basis 2 because it avoids round-off errors during the calculation of the exponent. The cover tree requires space. for all , . We will demonstrate that the expansion constant can be large and sensitive to changes in . for some integer . In this case, because and and this is obviously the worst case. Moreover, can be sensitive to changes of , e.g., consider set whose points are evenly distributed on the surface of a unit hypersphere, and let be a point arbitrarily close to the origin. 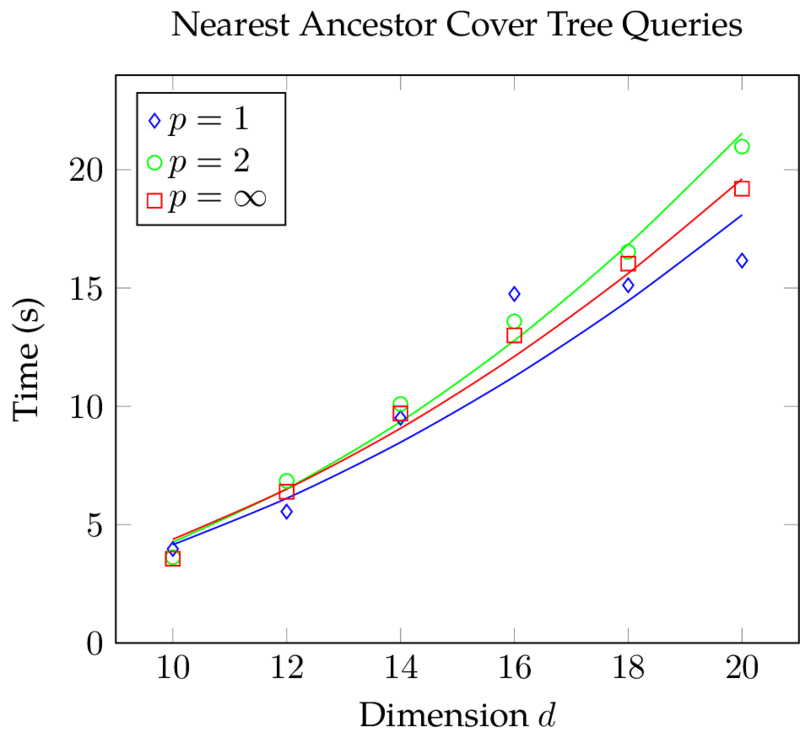 The expansion constant of the set is whereas the expansion constant of the set is (this example was taken from the thesis Improving Dual-Tree Algorithms). With these bounds in mind and assuming the worst-case bounds on the cover tree algorithms are tight, we have to concede that these algorithms may require operations or worse. Even if the points are regularly spaced, the performance bounds may be bad. Consider a set forming a -dimensional hypercubic honeycomb, i.e., with this is a regular square tiling. In this case, the expansion constant is proportional to . Note that the expansion constant depends on the dimension of the subspace spanned by the points of and not on the dimension of the space containing these points. Nevertheless, cover trees are used in practice because real-world data sets often have small expansion constants. The expansion constant is related to the doubling dimension of a metric space (given a ball with unit radius in a -dimensional metric space , the doubling dimension of is the smallest number of balls with radius needed to cover ). In a cover tree, given a point on level , there is a node for on all levels which raises the question how we can efficiently represent cover trees on a computer. Furthermore, we need to know if the number of levels in the cover tree can represented with standard integer types. we create one node corresponding to on each level whenever there are children, storing the level of the node as well as its children. a pointer to the parent binary tree node so that we can implement iterators (this is how std::map nodes in the GCC C++ standard library are implemented). Hence, for every level in the binary tree, we need to store at least four references and the level. The other representation must store the level, a reference to the corresponding point, and a reference to the list of children of this cover tree node so this representation is more economic with respect to the memory consumption. There is no difference in the complexity of nearest-neighbor searches because for an efficient nearest-neighbor search, we have to search the cover tree top down starting at the highest level. A metric maps its input to non-negative real values. On a computer (in finite precision arithmetic) there are bounds on the range of values that can be represented and we will elaborate on this fact using numbers in the IEEE-754 double-precision floating-point format as an example. An IEEE-754 float is a number , where is called the mantissa (or significand), is called the exponent, and is a fixed number called bias. The sign bit of a double-precision float is represented with one bit, the exponent occupies 11 bits, the mantissa 52 bits, and the bias is . The limited size of these two fields immediately bounds the number the quantities that can be represented and in fact, the largest finite double-precision float value is approximately and the smallest positive value is . Consequently, we will never need have more than levels in a cover tree when using double-precision floats irrespective of the number of points stored in the tree. Thus, the levels can be represented with 16bit integers. The authors of the original cover tree paper Cover Trees for Nearest Neighbors made their C and C++ implementations available on the website http://hunch.net/~jl/projects/cover_tree/cover_tree.html. The first author of the paper Faster Cover Trees made the Haskell implementation of a nearest ancestor cover tree used for this paper available on GitHub. The C++ implementation by Manzil Zaheer features -nearest neighbor search, range search, and parallel construction based on C++ concurrency features (GitHub). The C++ implementation by David Crane can be found in his repository on GitHub. Note that the worst-case complexity of node removal is linear in this implementation because of a conspicuous linear vector search. The most well maintained implementation of a cover tree can probably be found in the MLPACK library (also C++). I implemented a nearest ancestor cover tree in C++14 which takes longer to construct but has superior performance during nearest neighbor searches. The code can be found in my git repository. The worst-case complexity bounds of common cover tree operations, e.g., construction and querying, contain terms or , where is the expansion constant. In this section, I will measure the effect of the expansion constant on the run-time of batch construction and nearest-neighbor search on a synthetic data set. For the experiment, I implemented a nearest ancestor cover tree described in Faster Cover Trees in C++14 with batch construction, nearest-neighbor search (single-tree algorithm), and without associative arrays. The first point in the data set is chosen as the root of the cover tree and on every level of the cover tree, the construction algorithm attempts to select the points farthest away from the root as children. The data consists of random points in -dimensional space with uniformly distributed entries in the interval , i.e., we use random points inside of a hypercube. The reference set (the cover tree) contains points and we performed nearest-neighbor searches for random points. The experiments are conducted using the Manhattan, the Euclidean, and the Chebychev metric and the measurements were repeated 25 times for dimensions . for all , . We will now simplify both sides of the inequality. Consequently, the worst-case bounds are for construction and for nearest-neighbor searches in cover trees with this data set. In the plots, indicates the Manhattan, the Euclidean, and the Chebychev metric with the markers corresponding to the shape of the Ball . The figures below show mean and standard deviation for construction and query phase. 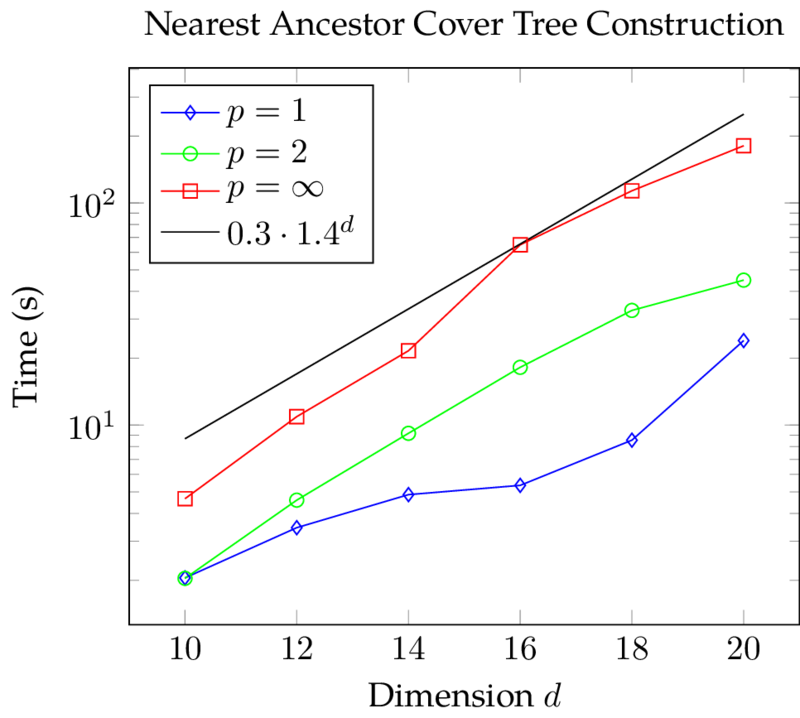 The construction time of the cover tree is strongly dependent on the used metric: cover tree construction using the Chebychev metric takes considerably more time than with the other norms; construction with the Manhattan metric is slightly faster than with the Euclidean metric. Observe that there is a large variation in the construction time when employing the Euclidean metric and this effect becomes more pronounced the higher the dimension . Also, considering the small standard deviation in the data, the construction time slightly jumps at for the Manhattan norm. In the query time plot, we can see that the results are mostly independent of the metric at hand. What is more, the variance of the query time is without exception small in comparison to the mean. Nevertheless, there is a conspicuous bend at when using the Manhattan metric. This bend is unlikely to be a random variation because we repeated the measurements 25 times and the variance is small. With our measurements we want to determine how the expansion constant influences construction and query time and according to the estimates above, we ought to see an exponential growth in operations. 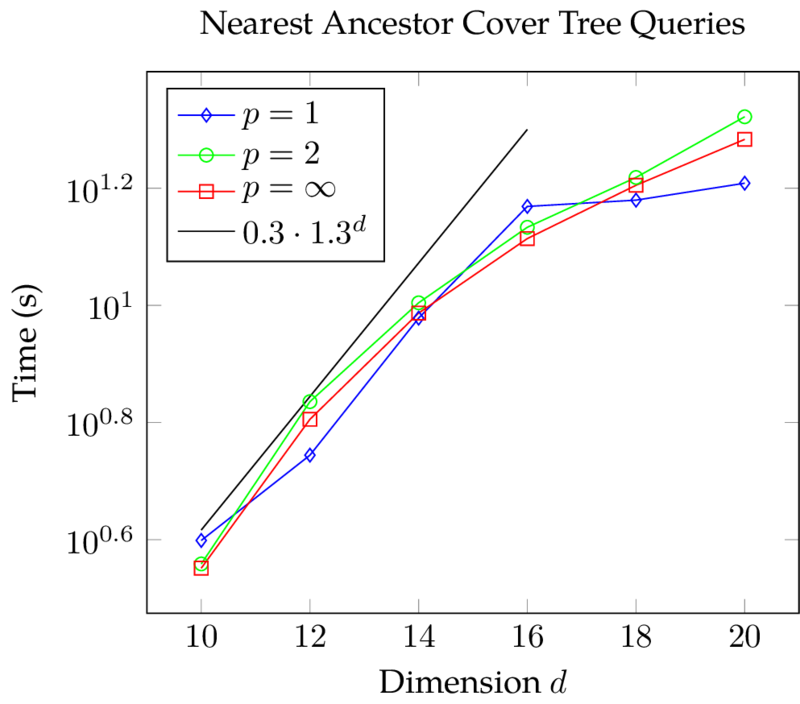 To determine if the data points could have been generated by an exponential function, one can plot the data with a logarithmic scaling along the vertical axis. Then, exponential functions will appear linear and polynomials sub-linear. In the figures below, we added an exponential function for comparison and it seems that the construction time does indeed grow exponentially with the dimension irrespective of the metric at hand while the query time does not increase exponentially with the dimension. In conclusion, for our test data the construction time of a nearest ancestor cover tree is strongly dependent on the metric at the hand and the dimension of the underlying space whereas the query time is mostly indepedent of the metric and a function of the square of the dimension . The jumps in the data of the Manhattan metric and the increase in variation in the construction time when using the Euclidean metric highlight that there must be non-trivial interactions between dimension, metric, and the cover tree implementation. Originally, we asked how the expansion constant impacts the run-time of cover tree operations and determined that we can approximate by calculating . Thus, the run-time of construction and nearest-neighbor search seems to be proportional to because and . We introduced cover trees, discussed their advantages as well as their unique theoretical properties. We elaborated on the complexity of cover tree operations, the expansion constant, and implementation aspects. Finally, we conducted an experiment on a synthetic data set and found that the construction time is strongly dependent on the metric and the dimension of the underlying space while the time needed for nearest-neighbor search is almost independent of the metric. Most importantly, the complexity of operations seems to be polynomial in and proportional to the logarithm of the expansion constant. There are unexplained jumps in the measurements. Previous PostSuperLU vs Direct SubstructuringNext PostCMake: "Errors occurred during the last pass"